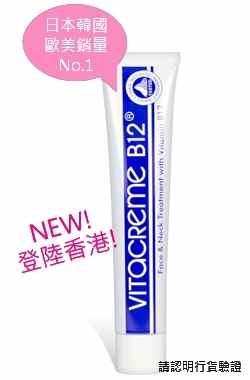 VITACREME B12 penetrates as far as dermo-epidermic junction thanks to its liposomic reactivating agents as well as the growth of germinative cells (Deeper layer of the epidermis) favouring the formation of elastin and collagen fibres. The result of more than 15 years of pharmacological and clinical tests, benefiting from references from well known neutral experts on the European plan. A Swiss product at the cutting edge of cosmetic technology. VITACREME B12 is registered with the Swiss Federal Office of Public Health (ref. BAG C 8512). The eutrophic activity of the vitamin which penetrates as far as the dermo-epidermic junction has, as its' principal quality, the procurement at the epidermis of the water necessary for the revitalisation of the upper layers of the skin. The action is therefore particularly important for dry or aged skin caused by regular exposure to sun or the cold.